A stable week for Bitcoin and confidence is slowly beginning to return to the market. There are signs of recovery beginning to emerge after a bear market of more than a year. Despite media coverage declining, and despite the eulogies that repeat themselves in the headlines, it seems that we have reached the floor in terms of declines and that money is beginning to flow back into the market, and the trading volume is increasing. The awakening is not only true for Bitcoin as it seems that there is a growing interest in the alternative coins (Altcoins) market in recent months, where we have seen a number of Altcoins whose prices have gained hundreds of percentage, which might point to the beginning of a new Alts season. One of the reasons for the market’s revival is the Binance fundraising platform, the Launchpad, which has completed a number of successful fundraising events that are similar to ICOs, only in a new cover. However, despite the success of the platform so far, the recruitment amounts are significantly lower than the ICO rounds seen in 2017. However, additional crypto exchanges have identified the potential, and it is possible that the market’s short memory will allow this trend to develop into an additional funding season. While investors are looking to make profit they should remember that Bitcoin is still correcting. Although it seems that we have reached the floor, it is still important to remember the market history and behavior that has erased significant capital in the past and unexpected corrections have happened before. In short, another steady week in the crypto market that begins to show signs of another life cycle after a long period of sharp declines. Coinbase Parts With Hacking Team Members: Does It Really? And Some Words About The United Crypto Community. While the CEO of Coinbase tenders a seemingly apologetic statement, the crypto community with one voice continues to speak against the exchange’s lack of transparency and its ambiguity. Government Of Argentina To Support Blockchain Projects From Binance Labs-LatamEx-via Founders Lab. Binance Labs, the venture arm of Binance, in collaboration with Founders Lab – Argentina’s local blockchain Accelerator sets out on a massive project to build a stronger ecosystem in Argentina. Samsung Partnership Was Confirmed: Enjin Coin (ENJ) Gains 75% In Response. Following an overnight bull run of 300%, Enjin Coin, a native cryptocurrency in Singapore, again enjoyed a price surge of over 75%, an increase which came after a partnership between the Enjin and Samsung. JP Morgan’s JPM Coin: Is It Really That Bad For Bitcoin And The Crypto Community? Brad Garlinghouse, CEO at Ripple along with Bill Barhydt, Abra’s CEO utterly condemn JP Morgan’s JMP Coin as purposeless and nonsense. Your Competitors As Your BFF: Ledger Finds Vulnerabilities In Trezor HD Wallet. Popular hardware wallet producer, uncovers more security vulnerabilities with Trezor’s product “Model T,” as part of its responsibility to enhance securities throughout the entire blockchain ecosystem. Invesco Launches Blockchain- Focused ETF On London Stock Exchange. The world’s biggest blockchain-focused ETF will begin trading on the London Stock Exchange. This initiative targets companies with real earnings from blockchain technology, and currently has about 48 companies on the list. This week we have chart analysis of Bitcoin, Ethereum, Ripple, KOMODO and Bytecoin – Read more here. 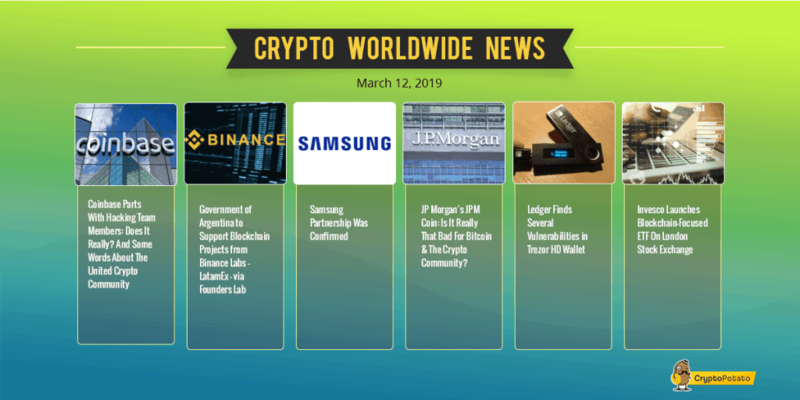 The post Crypto Market Update Mar.12: A New Altcoin Season? The Wide-spreading Exchanges Based Token Sales And More appeared first on CryptoPotato.